With the growing awareness and promotion of Eco-friendly products, use of eco friendly jute bags has gained impetus, since jute is one of the most Eco-friendly fabrics in the industry. A very tough fabric with natural appeal, it is widely preferred over plastic, cotton and paper. Bags made of jute are very handy, durable and are available in varied sizes from small to large depending upon the purpose and requirements. Also, being extremely tough and sturdy, Jute Bags do not get easily affected by the harsh conditions and are capable of carrying heavy items as well. Reaffirming one's commitment towards environment, Jute Bag Manufacturers have began to experiment with the bags in terms of colors, designs, weaves, handles, etc. Totally bio degradable, Jute Embroidered Bags are embroidered in eye catching designs with floral, abstract and different patterns. Embroidered Jute Bags can be put to various uses as Embroidered Shoulder Bags, Embroidered Shopping Bags, Embroidered Promotional Bags, Embroidered Party Bags, Embroidered Hand Bags, etc. Adorned in different styles and colors, a vast collection of environmental friendly jute embroidered bags suit to almost all needs and situations. 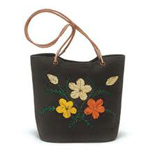 These bags are intricately designed, keeping in mind the looks, shapes, sizes, etc. Further, available in a variety of prints, jute embroidered bags exhibit a very stylish yet elegant look at pocket friendly prices. Whether, official or shopping or casual, these bags have gained considerable popularity among the masses. Not only in India, these bags are in high demand in other countries for their creativity, fashion and natural rough looks. Suitable for almost all types of occasions and situations, these eco friendly jute embroidered bags have become a fashion accessory for social gatherings, official purposes, parties and various other places.